If you follow me on Instagram, you’ll know that I had a few problems with milk over the Christmas period. Over autumn, I moved to glass milk bottle milk deliveries, in a bid to cut down on my single-use plastic. I love having the glass bottles and teaching my kids how to just push the foil lid just so. As much as I enjoy the chink of the glass bottles, the online system for reminders is hopeless; by that I mean it doesn’t exist. So, Christmas comes, the hot chocolate loving milk guzzling kids left and I had 12 pints of milk to get through. And they were starting to go off. First off I grabbed a sharpie and labelled which day the bottles had come on; this way I knew which bottles to prioritise. And then I hit insta. 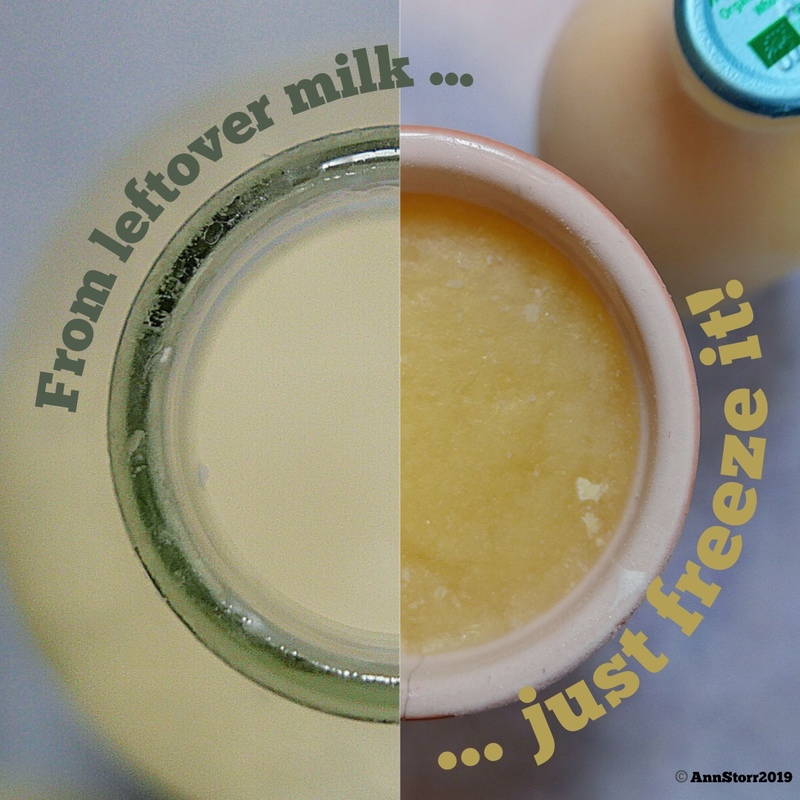 Freezing milk used to be a weekly activity for me, as I’d get it delivered with my veg box. But, thanks to insta user Sarah Leigh Mitchell, I learnt that you *can* freeze in glass – you just need to shake up the milk beforehand, empty a little to leave room for expansion and bob’s your uncle. I was a little unsure of freezing a bottle that might (hopefully) have been washed and used hundreds of times, but you can always pour into a plastic bottle. If, like me, you buy whole milk, then KUDOS BECAUSE IT’S DELICIOUS and gives you more leeway in terms of using it up (you cannot use semi skimmed or skimmed milk to make cheese etc). Also, be warned that it can go a strange shade of yellow when you freeze it. This is because the fat slightly separates. There’s nothing wrong with the milk at all, don’t panic! To defrost your milk, simply take it out of the fridge a day or so before you think you’ll want to use it. If the plastic milk bottle is still sealed, then you can float it in a bowl/sink of cold water to speed up the defrosting. Then use as normal.